Children laughed and waved their hands as lead singer and Delaware State Police Troop 7 Captain Alice Bailey waved her hands with them. 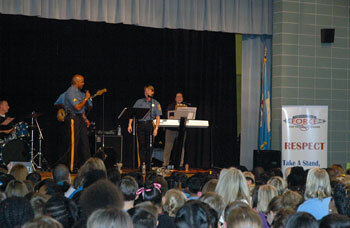 The band comprises a group of law enforcement and corrections professionals in Delaware who use music to teach children the importance of preserving their safety and well-being by avoiding drugs, standing up to bullying and violence, and by respecting others. Beebe sponsored the band and plans to sponsor concerts at two more schools in Sussex County, organizer Cheri Will, RN, Domestic Violence coordinator at Beebe, said, emphasizing the importance of educating children about bullying. Studies have shown that children who are bullied report feelings of sadness and loneliness. They also have increased illnesses and problems at school. To learn more about First State Force Band, go to https://firststateforceband.blogs.delaware.gov/ or find them on Facebook. Caption: The First State Force Band teaches children how to stand up to bullying through music. Here the band is shown during the Beebe Healthcare-sponsored event at H.O. Brittingham Elementary School in Milton this month.